You need an explicit and reasonable policy when deciding what to do about a tree that is hollow. Trees with cavities = trees with decay. Because the defect is on the inside, it is harder to see and judge the danger from the outside. A reasonable policy can’t be based on emotion. Extreme opinions such as "It’s a beautiful tree, leave it alone!" or "It’s a rotten tree, cut it down!" just cause more trouble. What do I need to know to make a reasonable decision? Does the tree have a likely target? Even a "bad" tree is not a hazard tree if it has no significant target to hit. 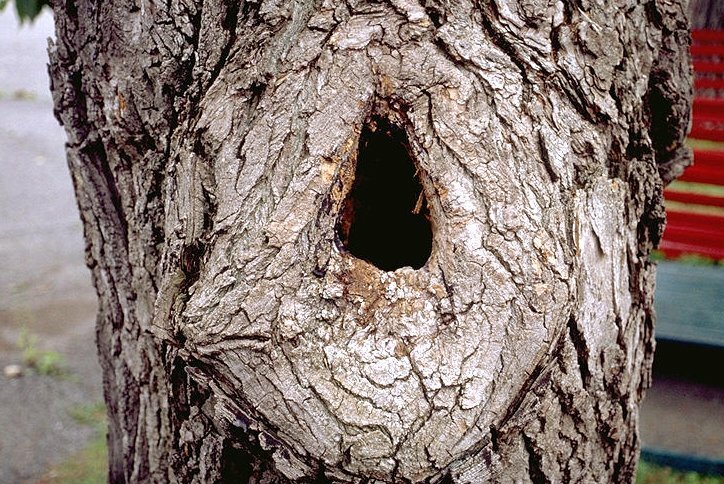 Remove a tree with a large cavity when it has a stationary target that is constantly occupied like a house. What kind of tree is it? Different species have different mechanical strengths and decay strategies. Be more cautious with species of high hazard potential such as silver maple, cottonwood and other poplars, willow, basswood, boxelder, black locust, and tree-of-heaven. What is the tree’s condition? Look for good overall balance, a full and normal crown, and at least 4" annual shoot extension. A declining and leaning hollow tree is much riskier than a vigorous and upright one. How extensive is the rot? Traditional methods include "sounding" (hitting the trunk) and probing a hole. Both are good techniques for finding the largest cavity, and to get a rough idea of its size. A more scientific but still low-cost method is to drill with a 3/16" long-shafted bit a few places around the trunk at the most likely point of failure. Measure how far up the bit you are when resistance drops, the shavings become discolored, or nothing more comes out. A precise record of resistance patterns can be had with new equipment such as the Resistograph®, though they are quite expensive. Research shows that a cavity is unlikely to make a tree fail at the spot measured if there is 1" or more of sound wood per 6" of diameter -- i.e., average sound wood thickness ¸ trunk diameter = 0.15 or more. This guideline has good scientific support for trees under 40" in diameter. Tall trees with a large canopy and on an exposed site require a higher ratio of sound wood to diameter. How can I save a tree with internal rot? You can’t. You can try to slow its decline, but you can’t stop the decay. The best--and cheapest--intervention is usually to help the tree do its own work of containing the decay. Supply weekly water during dry spells and provide 2-6" of organic mulch. Fertilization will usually not help much, although aerating the soil to promote root growth often benefits older trees. Nelda P. Matheny and James R. Clark, 1994. A Photographic Guide to the Evaluation of Hazard Trees in Urban Areas, 2nd ed., Savoy, IL: ISA. See also the Hazard Tree Web Page at http://www.na.fs.fed.us/spfo/hazard/index.htm. For other information, advice and help on this topic, call offices of your State Urban Forestry Coordinator or University Extension service, or visit urban forestry web sites.